This Skywalker 8×14 ft rectangular trampoline with enclosure is one of Skywalker`s innovative concepts that are designed to provide you with safety and contentment. 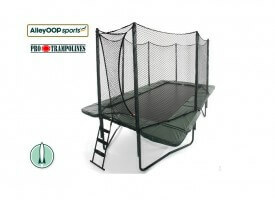 It is designed to suit trampoline lovers from the age of 6 and above. 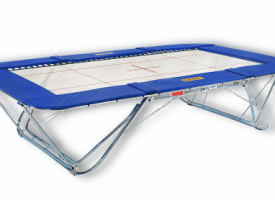 If you are planning to jump regularly, or if you are just wannabe gymnast, you will find out how fantastic this trampoline really is. This trampoline is not only for athletes but is perfected to provide whole family with fun and pleasure in times when it will be used! Rectangular design of this trampoline gives you all the room you might need to perform tricks or just do high intensity workout routine. Having fun along the process, definitely included. Workout on this trampoline will get you in shape quite fast – this is due to the high energy bounce with very low impact on your body. Regarding children, they too can feel free to use this trampoline and receive all benefits it has to offer. Of course, as those trampolines are mostly used by experienced jumpers caution is advised! 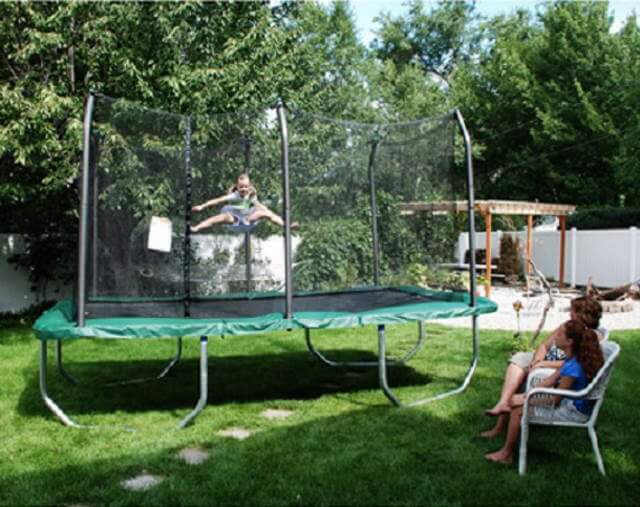 When it comes to safety features, Skywalker 8×14 foot rectangle trampoline has a mesh fabric enclosure that ensures a safe jump, especially for children and first timers. The mesh is locked with a zipper and three clips for double safety. As enclosure is the most important safety feature make sure to use it. Don`t like it? Take it on the bright side, it also provides partial protection from the UV rays! Gaps on this trampoline are removed by locking the mesh to the jumping pad. 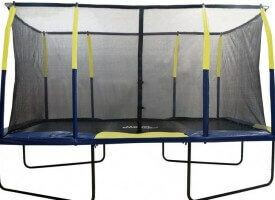 With this Skywalker Trampoline you can have fun with absolute confidence in it. 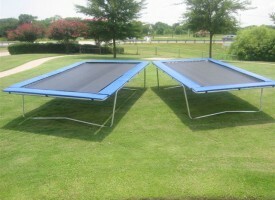 The Skywalker Rectangle 14×8 feet trampoline with enclosure is stabilized with 4 U-shaped legs. The legs are very wide for large surface area. On this trampoline, joints are made sturdy by interlocking its square sockets to T-shaped bracket. A layer of soft pad winds the steel frames that hold the enclosure mesh fabric. The steel is arch-shaped to move the mesh aside to create enough room for jumping. Gaps are almost invisible with the interlocking of the net to the jumping pad away from springs. Trampoline jumping pad is UV resistant and is made of high quality very thick vinyl. Enclosure net fabric is made from high grade PVC – durable and repellant to UV radiation. The material is also UV treated for durability. Jumping mat is designed with 82 intensely tested anti-rusting coil springs. This results in an enormous bounce. With the Skywalker Rectangle 8×14 bounce is very high due to its rectangular design and tensions on certain spring sets, while jumpers safety is assured with the enclosure net. The net is high enough and moved out to create enough room for a jump. Your safety is assured because all the gaps are sealed. Very strong and durable and thus can serve both the family for fun and aspiring athletes for training. The soft and high density jump pad makes a bounce high but landing very soft. This is a plus especially for children use and healthy growth. Maybe a little downside on this trampoline is very short warranty interval, which is two years on frame and only 90 days on other materials (including mat, enclosure, padding). Second this is fairly low weight limit, which is only 200 lbs. (90kg). Skywalker Rectangle 8×14 foot trampoline exhibits a high level of design and safety. Safety standards are high due to; the enclosure, the padding on frames, elimination of gaps and a zipped lock. Fun factor is enhanced by high density foam on jumping pad and high quality springs for high bounce. Stability is confirmed with the T-joint technology and U-shaped legs. Decent trampoline with a good price. 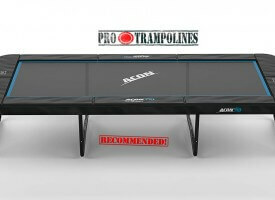 If you plan to own this trampoline you can be very sure in it`s quality, your safety and overall fun. 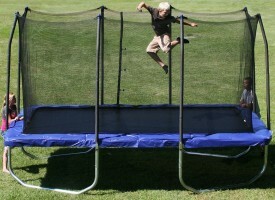 It is good rectangular trampoline and it comes with an incredible price! Make sure to check it out.